Someone made a backstory for this piece over on Reddit which I thought was awesome so here it is. (If the creator is reading this contact me and I'll credit your name!). Synthetic Neurons Over Wirelessly Monitored Artificial NetworkThe S.N.O.W.M.A.N. project was created in of all places, a research facility in New Mexico. Far from cold and desolate, the research lab was a self contained city that made cutting edge and beyond tech for the military. Its Combat Processing Unit runs at an extremely high speed and temperature and must be constantly cooled to prevent damage to the unit from overheating. Thus the machine was built in a deep freeze lab. After much field use the unit discovered that with modifications it could direct blasts of the cooling compound at close targets and thus added another deadly weapon to its arsenal. Features include A carbon lined and extremely sensitive olfactory system used for detecting levels of human pheromones, explosive compounds and other substances. Optical sensors with a diamond laced system for gathering light in differing circumstances. Recently the unit has been updated to remove a security flaw that caused it to reset to its Online Activation date when the head was removed and replaced on the chassis. Currently, the unit it ready and operational for assignments. Order one today for your military needs. First of all, I am trying to see where the snow is, but the general image is really interesting. There is light and lightning issuing from him simultaneously, adding the science fiction touch. The face is nonhuman although he is erect like a humanoid. The color andtexture of his body is really cool [no pun]. The bakground lighting and decription is suitabe for him. There should be astory behind him. I may write that in due time, and I will contact you for permission. I am impressed with this beyond the words I can write. ONe very eye-catching piece of work. 67 out of 69 deviants thought this was fair. was a badass robot Merc. 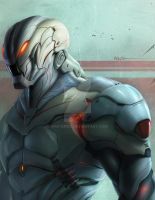 Cool Cyborg or Power Armor suit concept man. Reminds me of my OC Robo-Warrior's suit, only this is way more detailed than I can ever draw at this point. I've also taken a look at your other works and I must say you are pretty good at drawing machines, Power Armor and cyborgs. Keep up the good work man! This is one of the coolest things I ever saw! Vey nice design, finely completed with the text. very cool concept! i like the contrast of hot and cold coming from the "snowman". great work! Hhaha why thank you really glad you like it ay, took a lot of time working on this one so I appreciate it when someone leaves a comment like this, means a lot! I LOVE your stuff. Really Epic. You are one I watch. Keep up the good work! Haha thank you! Inspiring people is the greatest achievement I get as an artist! Your art is amazing. Truly astounding. how did you create that amazing smoke/energy effect?? any kind of brush, or effect you can advice me? I've been looking for tutorials for years, but most of them are specific brush shapes or the artist use other softwares. Dang, when I first saw this on reddit as a warframe I was ecstatic, I mean,he looks amazing! Incredible! You've always been great with anatomy but your techniques and the colouring of your pieces are just outstanding. I'm very much in awe with the work that you have been producing lately. Keep it up! Congratulations. You've made the frontpage of Reddit. I'd play a game if this guy was the lead character. You would think that lazers along with lightning powers wouldn't go together but you make it work so well!